Bengalis all over the world during these days of Durga Puja rejoice to their heart's content reconnecting with friends and relatives. Durga Puja is an occasion when the familiar sound of Dhak, Dhunuchi nachh,the mild fragrance of Shiuli, gives a familiar tug to every Bengali heart. Shoroter himel hawai mayer agomone shokole jeno thake bhalo. 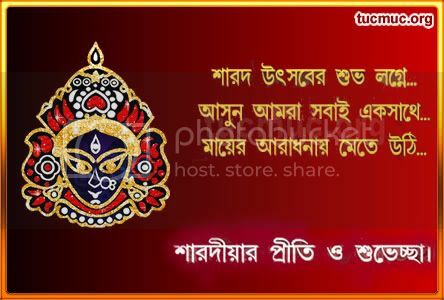 Onek khushi r onek aloi pujo jeno shobar kate bhalo.